When refilling and using Canon 3, 5, 6, 8, 220, 221, 225, 226, 250, 250XL, 251, 251XL, 520, 521, 525, 526, 550, 550XL, 551 & 551XL ink cartridges (tanks) in your inkjet printer, it is suggested to follow these general guidelines to help maximize print quality output and maintain a healthy printer. 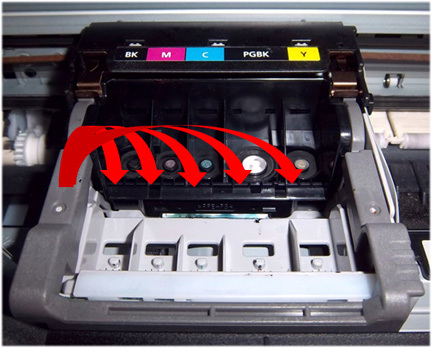 1) Return cartridge to refiller; re-program chip at base of ink cartridge (NOTE: Chip reprogramming DOES NOT apply to Canon 250, 251, 250XL, 251XL, 550, 550XL, 551 or 551XL cartridges – refer to Canon 250-251, 550-551 Refill Tips & Usage page). 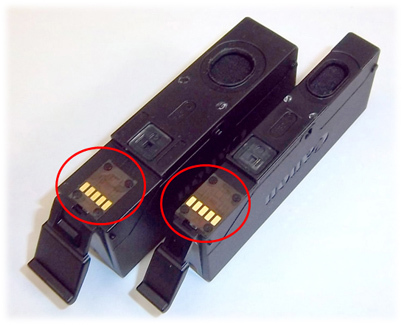 2) Remove cartridge from printer and thoroughly clean gold contacts of cartridge chip (pictured below). 3) Inspect printhead electrical contacts, to which each ink cartridge mates with, for cleanliness (it is suggested to use a flashlight). Ensure no ink residues are on contact surfaces. The replaceable or semi-permanent PRINTHEAD will eventually fail over time with usage and age. Click here for more information.